Picture by Amanda Hatfield for Brooklyn Vegan, taken at Prospect Park. 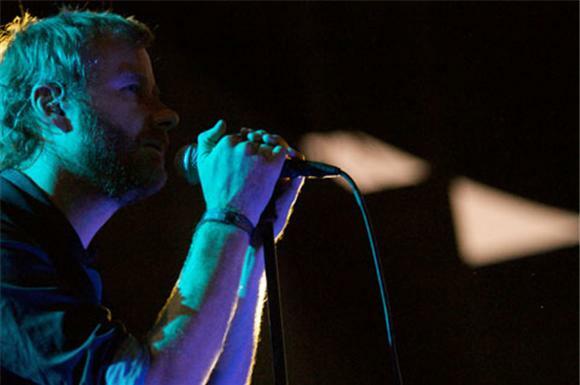 Matt Berninger rages pretty hard for a guy who barely lets go of the mic stand. The National hit the big stage last night for their second show this week (first, pictured above at Prospect Park with Beach House, and last night for the Spin 25 series of shows at T5, heavy on the sponsorship from a certain major credit card). They played most of High Violet, adding in a few oldies but goodies (songs any fan could name as show staples). A giant jib hung over our heads pacing back and forth, adding to the quiet nervousness that already dwells behind each and every National tune. But by the time the whiskey soaked in and the crowd made it to "Mr. November", the anxiety faded and morphed into a tremendous energy... amplified by the band's insistence in raising their guitars above their heads as Matt leaned into the audience screaming the iconic lines "I won't f*ck us over/I'm Mr. November". It certainly seems like since he wrote that line, he hasn't let us down in the slightest.